CDSS’s Valley Gives fundraising, on 12.12.13, will be dedicated to creating toolkits to support dancing in schools. Here is a local story about someone successfully introducing dancing to his students and families, told to me by CDSS Outreach Manager, Linda Henry. The person who initiated it is a music teacher. Let’s call him Bill. In his classroom, he has been teaching his kids dances and singing games for years, using the excellent resources sold though the CDSS store. Bill wanted his students to experience traditional dance and music in the context of community, in addition to their classroom. So he started imagining having a dance in his school that would include families and students. He contacted his PTO and presented the idea as an activity they could sponsor. This was a somewhat risky investment so Linda invited the head of the PTO to her local family dance, with free admission. 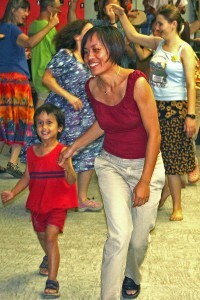 The woman came to the dance, saw what the dancing was all about, and had a hunch the families in her school community would enjoy it. Once Bill had the approval of the PTO, he asked Linda to find a caller and musicians. Linda had the great thought to invite caller Andy Davis, an excellent community dance caller, since she knew the kids in Bill’s classroom were familiar with Andy’s repertoire. She put Andy and Bill in touch with one another, and they planned a program. When Andy came to call, he included the dances Bill’s students already knew. The kids were the experts! They were dragging their parents onto the floor, getting them dancing. There were over 100 people at the dance, Linda said, and it was exciting and very successful. There were rave reviews from the parents, who loved dancing with their children, and the PTO said “We want to do this again.” Since that first dance, there have been two more. CDSS wants to create online toolkits to help more teachers, schools, kids and parents across the country enjoy dancing activities in their classrooms and communities. Your donation to CDSS on 12.12.13, Valley Gives Day, will support this project and CDSS outreach. (You can schedule your donation ahead of time by going to that same link.) Please support this fine project. This entry was posted in Features & Fun on November 26, 2013 by Lynn Nichols.